Taking the hypothesis of ultra intelligence to its next step, what if we really know the absolute outcome of every recipe we make in life? 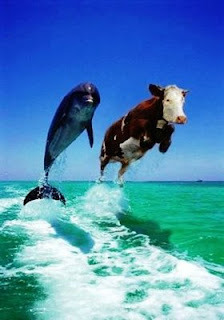 Not fake, not "The Truman Show". What if our experience and judgement and data and correct premises were increased a thousand-fold, or by a million? If we could almost intuitively anticipate the "butterfly effect?" It might make life incredibly boring. Would we be like cattle or ants, grazing? Grazing on lots of different ideas and information, but all predictable, and it would pass through us like cud. Or we might replace the "risk" and uncertainty by expanding our horizons geographically, taking what we know and are certain of, and placing ourselves in new frontiers. "Star Trek" or "Dr. Who" is a way we can always imagine shaking things up, going to other solar systems, to seek out new worlds and new civilizations, and boldly go where no one has gone before. Trying new foods is good. Eat the same thing, every time, is like ... eating grass. What if we actually make ourselves feel more in command of all information by reducing the amount of information? What if we limit our geography so much that we really do know and can anticipate an extremely high percentage of what we encounter? Instead of a hypothesis where we increase our intellect a million-fold, and then reach outside the solar system, why don't we shrink our system so that the intellect, intelligence, and data we have is preponderant. If we put our butterflies in fishbowls, or vacuum tubes, their effects will be easier to predict. When an African really wants to buy something from me... not everything, not all assorted junk, not 75% of the "e-waste", but something rather specific - say a 17" display screen (which will light up in a slum with electric current too weak for a 27"), I may have to admit I don't know what will "ultimately" happen to it. Perhaps I cannot predict the fate of the monitor in our custody. If we shred it together with the 32" TVs and obsolete printers and clickety keyboards, and spit out a stream of shredded plastic, shredded copper, aluminum, and steel, drawn by magnets, optical sorters, and eddy currents, then I don't really need Watson to make the decision what to sell anymore. Everything is now a commodity, a stream of raw material. We would be heartless to ignore the images. Poor child workers, huddled over fires, stoked with the coals of yesterday's technology. As westerners spend more and more lavishly on shiny smart phones, flat screens, and tablets, with the world's wiki-media at our fingertips, it seems apt to pause and think about the impact of the wealthy's consumption on the planet's resources, and of the worlds poor, left seemingly farther and farther below us, inside a muddy pit of toxic fumes. Photographers like Pieter Hugo capture the wet irritation in the eyes of the black teenager. Filmmakers like David Fedele slowly let the reel turn and record the images of kids trying to make a living off of the scraps of electronics once imported into their cities. Cairo, Lagos, and Accra, the megalopoleis of urban growth, stream with cell towers and internet today. But the poor just outside those cities, at their unlined, unregulated, unspoken dumps, seem to stretch their arms out of a moat. Their slow effort to climb out of poverty, through urban mining, makes Europeans and Americans feel guilty, ashamed of our wealth. Reminded of these "poster child" recycling workers, seemingly without even boots to lift as they climb, we want to check a box. We want to say we are certified. We want to pass a law, a ban, to address the unfamiliar black faces hauling too familiar CRT televisions, VCRs, and refrigerators. To say we have done our part for Africa and change the topic. Turn the page, please, make the images go away. There are indeed many important topics in the so-called "third world". How much of our time should we devote to "e-waste"? Where does it belong on this list? Who to partner with in Africa, if you are trying your hand at business development? "AS GLOBAL investors salivate over Africa's economic growth, Ashish Thakkar, founder of the Mara Group, explains why success still hinges on local knowledge"
I repost this because it's very close to my takeaway, when I left Africa, thinking "I shall return". The people who fix things, who tinker, who repair. They tend not to be liars. It's not the way a Fixer's brain is wired. This interview by the Economist with African development expert Ashish Thakkar says much the same thing. "What do you think is the single most important thing..." to help Africa? Answer: People who make improvements. Follow people who fix things. The Term Paper Theme in the blog (past 3 months) has been a real stretch. I'm just not able to write a Ph.D thesis from the coffee lounges of hotels, at least not writing which is accessible to non-academic readers. But I write on. If there is something "breaking" I think industry should know, I promote it so it gets the 500 page reads. But the goal is not to have every post widely read. 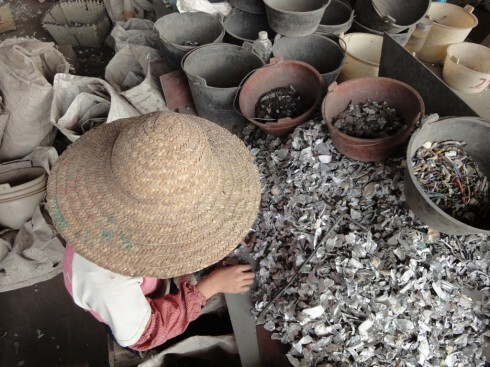 The biggest problems in the E-Waste and WEEE research-osphere have been from documents like West's of MIT which are written densely but don't define what they are researching sufficiently enough to escape the gravity of bias against trade between Rich and Poor. Two examples in the past 4 months actually reprint the "80-90% export to primitive recycling" statistic which even BAN.org has abandoned after the UNEP duplicated previous research (Peru) showing only 15% of the exports are for primitive recycling. Why the stubborn belief that Externalization of toxics from rich to poor describes most of the trade? In my previous "@term paper" blogs I showed how enforcement does police higher property values, which is why you can't mine gold in the Cleveland Heights OH... and I've written how ROHS inadvertently externalizes a very very small risk (leaded solder) from rich people landfills by destroying coral reefs and creating more toxics in Indonesia (where tin, the non-toxic replacement, is found). Externalization does happen. But the fact it happens should not make it believeable that poor people in developing nations pool their money to buy e-waste and pay thousands to transport it across oceans, through customs, to burn it. My company ships TVs to our Fair Trade Recycling operation, Retroworks de Mexico. We pay the transport there. But that is rare. Most exports are paid for by the buyers. We've pretty much proven they have no interest in the junk (unless it's mixed in as TAR), that they have high reuse. But even a big name consultant like DSM Environmental reprints the fake 80% statistic in a report less than a month ago. Why the persistant belief in false risks? Muggings do happen in Harlem, but 80% of Harlem residents are not muggers. Today's thesis: Opinion favors the concept of "underdogs". That is probably genetic ("won't someone please think of the children"). And it is marketed to by all sides, conservative and liberal. People are more likely to interfere in the marketplace if they believe one of the two parties is an underdog. Humans have an innate or genetic trigger to prefer "Underdogs". I explained to my youngest son last night why his older brother and I were rooting for Maryland in the final minutes of the NCAA game vs. #2 Ranked Duke. I'm a fair weather NCAA basketball fan... when my hometown Arkansas Razorbacks beat previous #2 Florida a couple of weeks ago, it got my attention, and I started watching games again. I've done a calculation based on the increase in news stories about proxy bank account compromises, phishing, identity theft, and piracy. It turns out, at the current rate of increase of online bank fraud attempts, hacking, and proxy server compromises, that we can now project the following: in the next 50 years everyone in the world, all 13 billion, will be billionaires... For 15 Minutes of Wealth. At that time their "15 minutes of life savings" will be snatched and re-deposited to the next billionaire. And so on, and so on. It's actually better than Communism, maybe. The wealth will learn to move so fast that people won't be able to possess it long enough to be spoiled by it. Jim Puckett, executive director of the Basel Action Network, talked with me about reuse markets in November, at a conference in Las Vegas where we were both making presentations. To paraphrase William Munny (Clint Eastwood's character in Unforgiven), "It's a hell of a thing," shooting a man's reputation. 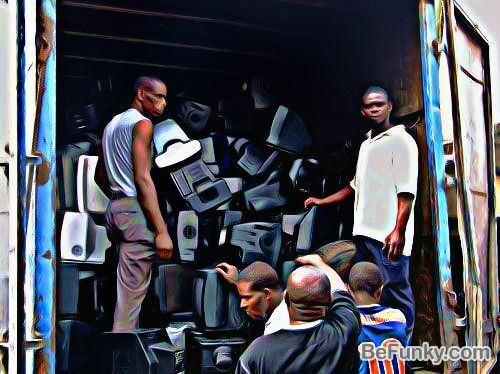 So if you'll bear with me in re-tracking the conversation, I will give you legitimate concerns about the free market exports of used CRTs to Africa. And no, it's not what the press thinks, and the solution is not to ban the trade. First I'll defend the exporter. Then I'll say what is really going to go wrong with the exporter's business model in the not distant future. After Jim's Vegas PowerPoint presentation, I raised my hand and asked him a question about this photo (and accompanying article) in his slide show (artified below). Jim said he had taken this photo himself, in Lagos. The UK article he had shown describe the arrest of Joseph Benson, the Nigerian "waste tourist" who purchased TVs in England and shipped them to Lagos (at an average cost of about $10,000 per container). First, I told Jim that these uniform size TVs did not look like "80% of UK E-waste". It was actually pretty difficult to put together a full containerload of this size of TV. I told him the demand for these were the urban ghettos, which often had spliced electricity too weak to light up a (more common) large TV set, and living spaces too small for larger televisions. I also told him (as I did in 2006 when we spoke following the Charles Schmidt NIH article) that the amount of copper in the 600 or so TVs in the photo would not pay for the $10,000 cost Mr. Benson paid for the container. At about $3 per burned TV (scrap value), the 600 TVs would only get Mr. Benson about $1,800 of his $10,000 back, and I didn't see how "avoided recycling costs" or "externalized pollution value" would be transferred to him. locally and sold to consumers and the other half was un-repairable. " You may remember Jim's first response was "Who is Joseph Benson? I don't know that name". I told him it was the man's name in the news article he had just shown (arrested) and the likely supplier of the TVs in the container Jim had photographed. It was not a good response. I told Jim that according to the math above, that 85% of the container was reused, just as predicted in my 2010 Blog "Monkeys Running the Environmental Zoo", and precisely what I predicted to Mr. Schmidt based on the financial calculations. This was originally just a reaction to a Facebook Meme about something something being bad. The number of things people lift their little petty pricky fingers to protest (troll) online is pitiful. It's so negative out there, that you'd think anything "free market" or "free trade" is presumptively evil. Idea: It's a Wonderful X. Make the movie (or short slide show) about things we hate (e.g. Wal-Mart) and how life would be if they never existed. I don't "LOVE" WalMart, but I do realize it's the same as a massive Co-op for poor people, bringing prices down by bringing needed jobs to other poorer people. It probably gives more to the poor (through lower pricing and net jobs) than tax-rebates or Salvation Army. Anyway, the concept is that when we oppose or hate something the free market created, we should make a little It's A Wonderful Life movie to make sure that (e.g., never invading Iraq) the world would be better today, or not. I think there are real legitimate things to protest (loss of endangered species, loss of rain forests, etc.) which will NEVER survive the "Wonderful Life" Test. I'm not pure free market, but people who postulate that free-market=evil are alchemists. This is actually a good enough "tweet" for a blog post. My grandfather's name was Clarence, and my son's middle name is for the Grandfather, not for the Wonderful Life Angel. Grind it even smaller and create even more jobs? The report has good people behind it - My buddies Ted and Natalie at DSM Environmental. And it's pitched by my favorite E-Steward, Neil P-M of Cascades. If material is recycled rather than discarded in landfills, more jobs will result. If the material is processed in the USA rather than exported, more USA jobs will result. The first is true. And I will take some credit, I did the first "Value Added by Recycling Industries" report at Massachusetts DEP in 1992, which was re-contracted to DSM to verify that decade. 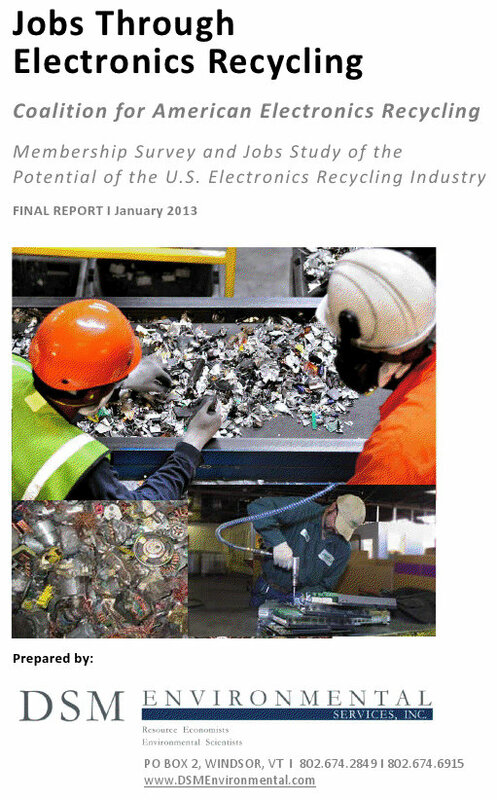 Recycling does create more jobs than burning or disposal. That is because of the Value Added - the value in the material, such as the refined plastic, the refined metals, etc., is preserved, rather than just lost at the dump. The second is completely false. I can prove that in a couple of ways. First, take a look at the photo on the cover of the report. Shredded materials from a big machine. The largest and most prominent companies on the web page above use big shredders. Then they export the shredded material... partly sorted by magnets into cleaner streams. But generally it is not clean enough to avoid another manual sort. Now I have nothing against the Chinese person in the photo above. I just prefer to deal with people in repair markets, using the system I describe below. Repair markets also preserve value - more value, in fact, than recycling does. And lo and behold, just as the shredder creates jobs in the USA by exporting shredded metals diverted from landfill, based on the preserved value... by golly. The more value we preserve in reuse, the more people we export intact products to, the more people we hire in the USA. Just as diverting metal from a landfill into an export stream of metals creates more jobs in the US, diverting reuse material from the shredder, preserving MORE value, creates even more jobs in the USA. The shredding machines replace workers at plants like mine, which use hand disassembly. How can my company possibly out-perform these big companies, outbid them, using manual hand disassembly? The only way is by doing what humans can do better - recognizing reuse value, and separating intact parts with retained or added value (like rare earth hard drive magnets which are lost in the shredder). Follow the photo trail below to see how all these categories of preserved value exported from the USA create jobs in the USA. My company also sends raw materials, like the shredded metals above, overseas. We don't do it as quickly or efficiently by hand as the shredder does. But our manual laborers keep aside the parts that have even more value intact than they have shredded. Our company creates more jobs by doing more things with the export market than just selling "raw material". We underbid the shredders... and we create more jobs per ton - by exporting appropriately and fairly. Look at the DSM study cynically for a moment. Shredders cannot compete fairly against reuse, so they want to pass a law against it. But "jobs" is not the reason. If I can't export the 20% of good stuff my manual disassemblers catch, I may as well replace them with a big metal shredder. Below is the data on material collected by my company, in 2012. I will show in photos why we employ MORE people by exporting that top quartile of material than if we recycled it in the big blue "raw material" 74%. Let's also address the myth of "stack and pack". I used to think my company was special by doing most of the work in the USA. What I have learned during the past 10 years is that no export market EVER purchased and exported the "whole enchilada". 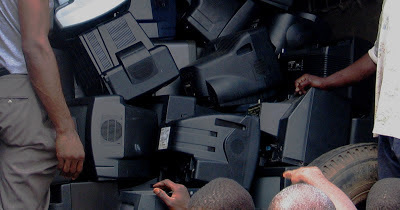 TVs are most of the e-waste, and the only ones the export market ever purchases are nice shiny black ones and small 17" ones that will work on weak current. Freeze frame of Greenpeace film of Ghana. Who's caught red-handed? The exporter or the racial profiler who says this is raw e-waste for disposal? Clue: talk to the buyer. This isn't saying that all companies who export do an equally good job of sorting out "toxics along for the ride" junk, or ship equally high quality material. 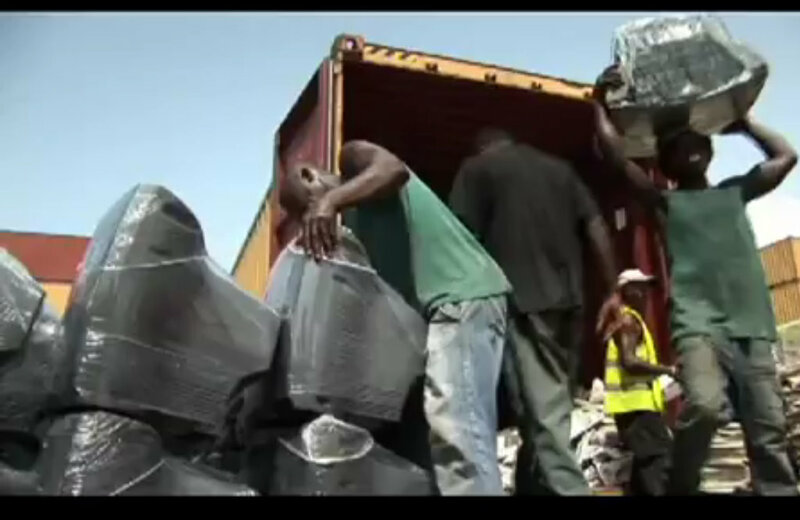 Fair Trade Recycling, which we support, seeks to raise the standard on all used electronics exports. But realistically, you cannot raise the standards in a supply-and-demand economy if you are shredding the supply. Given the choice between buying a 2003 computer monitors, and a 1996 monitor, Africans will buy the newer one. But if the newer one is shredded, expect the African to buy the 1996 model rather than go with no computer display at all. My Vermont Company can beat CAER "zero export" companies in a fair competitive bid. This is NOT because we employ fewer workers... quite the contrary. It's because our sale of 15% of the material overseas generates 60% more income than we'd make shredding it for metal to export overseas. We hire more people per ton than the CAER's shredding system, and they want to pass a law to eliminate the staff we have sorting and reusing and exporting, because we make more money... something you HAVE to do when you employ more people. Being charming and being offensive at the same time is tricky. It's also fascinating, an entire Hollywood genre. Anti-slavery advocate John Brown may be my hero... he created a space for Abraham Lincoln and Frederick Douglas to work inside. But if you don't have a popularity guru, and aren't part of a Lincoln-F.Douglas team, it does help to build up chits, credits, and bitcoins of goodwill. Count your cultural ammo before you embark on something really worth being contrary over. It's not a secret, but it has to be a habit, like a banker saving interest, or a cowboy counting his bullets. Sometimes we discover an injustice in our group, and we have to buy or earn attention to it, until we recruit our Great Communicator like Abe Lincoln, Mark Twain, or Frederic Douglas. Until then, how do we promote justice while remaining acceptably affable? How do we communicate the need for change to people who aren't really in the business and whose attention we are borrowing? It's kind of like selling Civil Rights Movements at a Little Rock Garden Club meeting, or Women's Suffrage to a Chicago Country Club, in 1925. Take note of what you are spending with this Charm Econ earnings report by Sebastian Drake. Maybe we can assign earnings per day to each habit and treat it like a checklist. Follow these steps, and be less unpopular. But when is Charm over-rated? When you fail to understand that "waste" is relative, and you apply the precautions over past waste in present contexts, you would take the used printing press from Benjamin Franklin, you'd take the used RCA victrolas from from Japan Victrola Corporation. The movement of used goods from "haves" to "have nots" is a story of opportunity. Sales of working product (USA producing new cars and selling them to Europe) is an exchange from "haves" to "have nots". Donations of rice to children is an exchange. Purchase of coffee from a country that has coffee, for consumption in a country that does not have coffee, is an exchange between haves and have nots. When you study the history of development, and the history of tinkering, and the history of new products, from light bulbs to flush toilets, you prepare yourself to do a better job trading in commerce. Or you can tell yourself that prohibition, boycotts, and bans on commerce are the answer... if you ignore the history of prohibition, bans, and boycotts. "It's Ok! It's recycled mercury, from USA lamp recycling. We're using it to get virgin gold, not recycled gold! USA lamp recycling (mercury retort) is all sold to us to get gold from rivers. That's good!" "It would be bad if we were getting value out of waste. We get value out of rivers." "And we don't have to work in a repair job." Never mind THOSE poisoned children. (article on mercury poisoning of fish from African rivers) The NGOs didn't photograph THEM. (Link above to press release on mercury poisoning in African rivers, contaminating fish cultures and fish ponds established by Peace Corps volunteers like myself in the 1980s). Mercury is used to mine gold. News alert - it's far, far, far worse than gold extraction from aqua regia "acid baths", which I've never seen or heard of in Africa. But all the policy debate is about how Africans "might" use acid baths for circuit boards, while in actuality, Africa is the final resting point for mercury which American recyclers spend billions of dollars to divert from our RCRA landfills.